Ever wonder where energy is used in a home? The HERS Index is a scoring system that “rates” a home’s energy usage compared to a code minimum reference home. The details that determine the final HERS score are extracted from plans, onsite visits, and building performance testing (diagnostics) and inspections. The lower a home’s HERS Index, the more energy efficient it is. A HERS Index of 100, would indicate the home complies with the minimum code requirements while a net zero energy home would score a HERS Index of 0. Each 1-point decrease in the HERS Index corresponds to a 1% reduction in energy consumption compared to the HERS Reference Home. In North Carolina, a HERS score is not required, but in other locations for homes to comply with the new 2012 International Energy Code a HERS index of 65 or less is required. This old adage is particularly true in regards to building performance. Heat, air, and moisture flows are not necessarily intuitive or recognizable without the use of specialized diagnostic equipment. These same building dynamics can cause comfort problems and waste energy, all of which is easily avoided if the guess work is eliminated. This encompasses Enclosure Testing with the blower door, zonal pressure testing, and infrared thermography. Also included is HVAC testing made up of duct testing, pressure pan testing, and static pressure testing. Finally, bath fans and range fans may be tested. And what about the V of HVAC…there are standards prescribed for ventilation of a house and those will be addressed also. 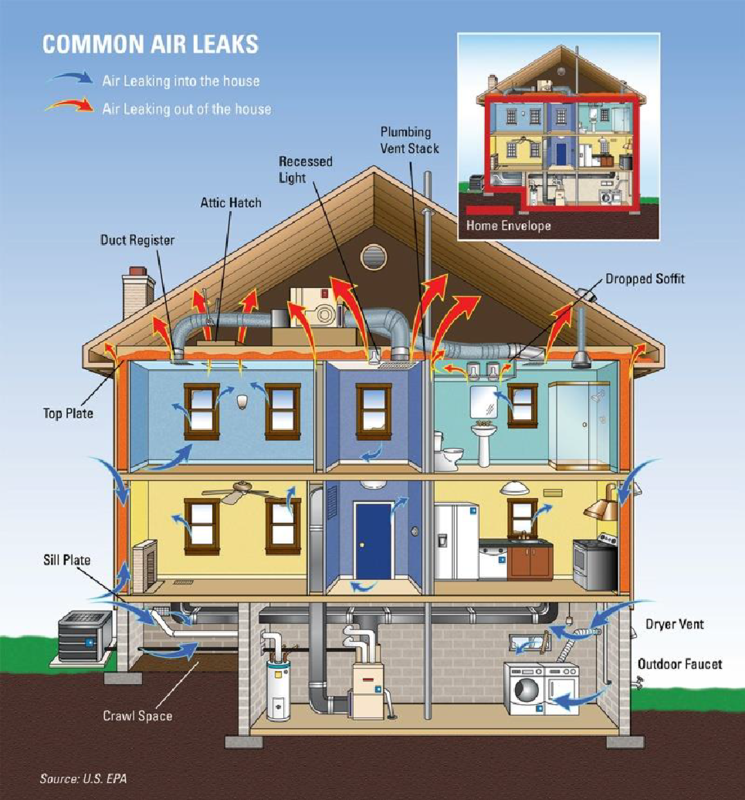 A DOE approved standardized method for a quick yet reliable home assessment, usually used on preexisting homes to understand the envelope and major energy systems. This system allows for compairison of homes and leads to recommendations for performance improvements. Quicker and cheaper than a full energy audit, it serves as an entry analysis for performance. The onsite assessment usually takes 1-2 hours followed by entry of data gathered into a computer model for output and grading. This system works on a 10 point scale, 1 being high energy consumption and 10 being lower energy consumption. 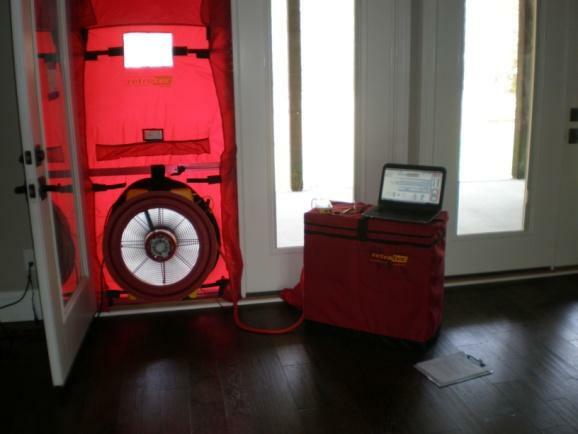 A Blower door is a diagnostic tool designed to measure the airtightness of buildings and to help identify air leakage locations. A blower door consists of a calibrated fan for measuring the airflow rate, and a pressure-sensing device (manometer) to measure the air pressure created by the fan flow. Knowing the air-tightness of buildings helps us predict energy usage and anticipate ventilation needs to ensure adequate air exchange rates. We also can certify for code compliance on air leakage. A dust testing rig is used to depressurize the duct system and measure leakage. The calibrated fan and manometer provide the information needed to determine if the system meets code, based on the size of the home. If for any reason the system is not in compliance we can work with your crews or subcontractor to rectify the problem areas using a pressure pan and smoke to assist in finding the problems. Our field staff is highly experienced at testing, troubleshooting, and finding duct leakage and has provided duct training services for contractors. Infrared imagers when used by themselves or in conjunction with a bower door fan can reveal otherwise hidden air leaks, insulation problems and bypasses. Generally homes are viewed both internally and externally without the blower door to look for thermal bridges, missing insulation, and moisture issues. 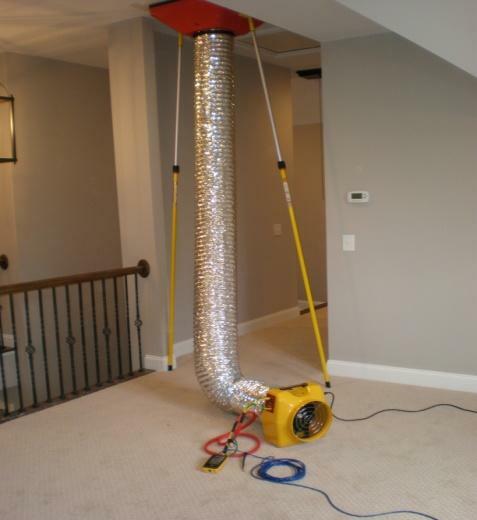 When used in conjunction with a blower door, it is a more efficient inspection of the air barrier. In the summer, using the blower door to depressurize a house, it is easy to see warm air as it enters as it heats surfaces it passes over. These surfaces appear to have streaks with the camera. Air Sealing is where you can get the biggest return on your money and is generally the first thing we recommend to both Builders and Homeowners. It’s a one-time fix and can have a huge impact on your comfort and power bills. Using the equipment above, we can help locate those pesky holes in your thermal envelope that need to be closed up. Typical areas to be aware of are as follows.